Side sleeping is the most common sleep position. 74% of us are side sleepers. 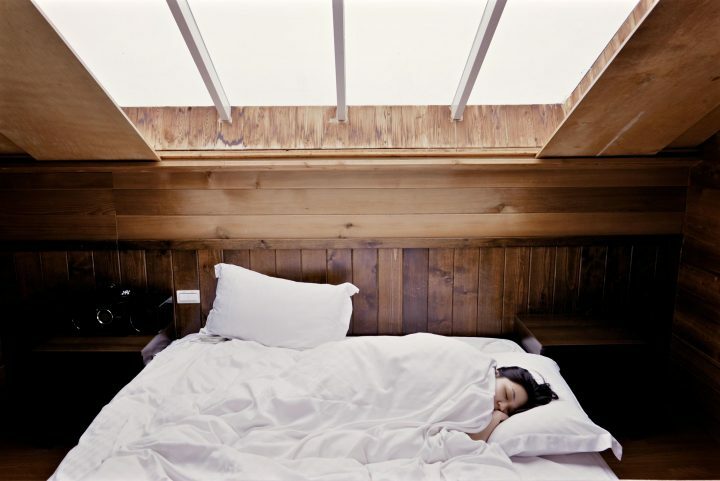 It’s no coincidence—side sleeping is both comfortable and healthy. 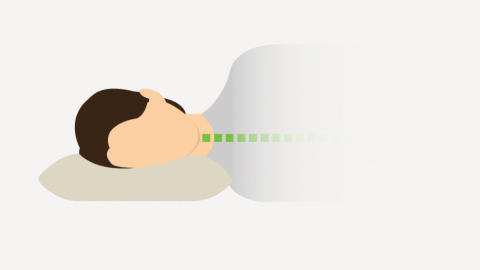 Sleeping on your side helps your head, neck, and spine maintain a neutral position. A neutral sleeping position keeps all the bits and pieces in your back in in their ideal positions, preventing unnecessary pressure on your discs, muscles and nerves. Keep your spine neutrally aligned and you’ll avoid discomfort (and worse). Unfortunately, it’s easy to fall into bad sleep habits, especially when we’re young. The consequences of these bad habits often do not become apparent until we hit middle age. Suddenly subtle aches and pains become prevalent and impossible to ignore. Sleeping on your stomach can result in aches and pains. A Frodo-sized mattress like the one pictured above won’t help either. If you’re using a pillow your neck is likely bent too far upward. Your hips can sink too deep into your mattress creating an unnatural downward bend in your lower back. Further exacerbating these contortions, your neck has to be twisted ninety degrees to the left or right (you can’t breath into your pillow, after all). Given this page’s title, I suspect you’ve arrived here with a desire to become part of the comfortable and healthy majority! With a little determination and practice, learning how to sleep on your side is totally doable. 1. First, be sure you’re using the right pillow. Side sleepers get the best rest on thick, firm pillows. When on your side, your pillow’s job is to fill the space between your head and your mattress while keeping your body in a neutral sleeping position — your neck and back should be in a straight line without any upward or downward bends in your spine. Side sleepers will be most comfortable on a firm or extra-firm pillow. Believe it or not, your big ol’ head weighs about 11 lb. 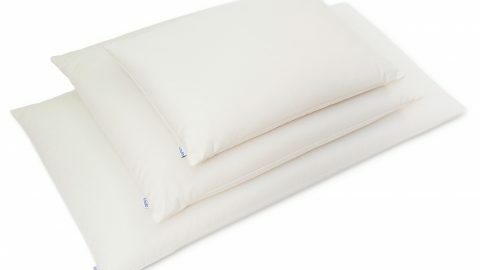 Softer pillow types like down tend to collapse under the weight during the night. This loss of support will cause your head and neck to bend downwards, resulting in unnecessary strains that can lead to neck or back pain. Side sleepers are also advised to use a pillow with more loft (thickness) than other pillow types. This is simply because there is more space to fill between your head and the mattress when on your side than when on your back or stomach. Your pillow needs enough loft to support your neck and head at the appropriate level, keeping your entire neck and back in a straight, neutral sleeping position. Above all, your side sleeper pillow should be comfortable – trust your instincts! Experiment with different pillow types and find what works for you. 2. Try using positioning pillows. Extra pillows in the bed can help to keep your body positioned on your side. Former stomach sleepers: a pillow under your arm can A). help to simulate the feeling of being on your stomach and B). prevent you from rolling onto your stomach. Former back sleepers: a heavy pillow placed behind your back will help to prevent you from rolling to your back. You can also try using a pair of pillows on either side of your body if you tend to roll from one side of your body to the other. Buckwheat and millet hull pillows will both work well — they’re heavy enough that they’ll stay put in your bed while you sleep. 3. Sew a tennis ball into the front or back of a pajama shirt. 4. Try sleeping on a narrow sofa. If you’ve got no space to roll onto your stomach or back, you’ll be forced to stay on your side. Give the sofa a couple weeks of side sleeping practice and then switch back to your bed. With any luck, it’ll be easier to maintain a consistent side-sleeping position throughout the night. It’s hard to know what’s working when you’re asleep! Take note if/when you wake up on your side in the morning. Keep track of the behaviors that allow you to comfortably sleep on your side and then purposely strive to turn those behaviors into habit. The most important thing you can do is keep at it. It can be very difficult to break an old habit. It can be incredibly difficult to resist the urge to roll into your habitual sleep position. It’s hard to think rationally when you’re exhausted! Always roll back to your side when you catch yourself positioned otherwise. Try my recommendations and be sure let us know about your own tips and experiences in the comments below. Have you ever tried a buckwheat pillow? Give Hullo a try for 60 nights. Thank you for pointing out that sleeping on your stomach can cause neck pain. My husband is a stomach sleeper and has started waking up with sore neck almost every morning. I didn’t know that sleeping on your side is recommended to everyone to avoid these health issues, and I’ll definitely be sharing this article with him so he can try to break the habit.